Clinical Microbiology is a comprehensive diagnostic laboratory that, in addition to receiving patient specimens from the UCLA Health System, also acts as a referral center for other hospitals and clinics in Los Angeles and nationally. Dr. Omai Garner coordinates resident training in Microbiology. The section also has several postdoctoral fellows in Microbiology with whom responsibility is shared. For each section, there are accompanying study objectives, reading assignments, and self-study problems. Additional bench time can be arranged if desired. 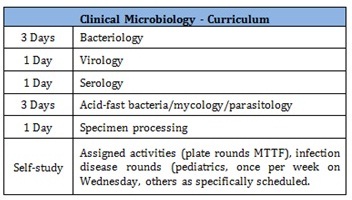 Extensive training materials are available for resident use in the lab, although purchase of one of the clinical microbiology texts is recommended. Activities include daily plate rounds with faculty and weekly rounds with clinicians, administrative conferences, and time for bench work or independent activities. In the course of the various rounds and administrative conferences, situations will arise requiring problem solving, case investigation, test utilization or implementation analysis, lab and hospital in-servicing, or presentation at clinical conferences. Residents will be expected to pursue these as requested by the faculty. 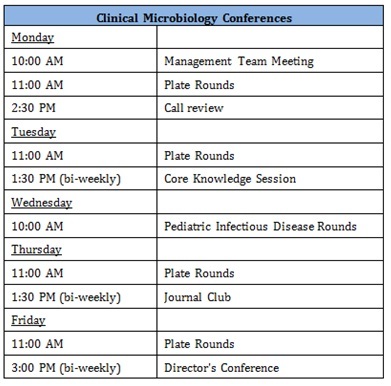 Residents will be scheduled to coordinate and make presentations at the weekly Pediatrics ID plate rounds, and may be scheduled to present at the Clinical Microbiology journal club. Weekly call review is held to follow up on interesting call and sign-out problems from the prior week. Biweekly Director's conference and Core Knowledge sessions with faculty are used to address key clinical microbiology concepts, laboratory methods and regulatory issues.